The McCartney Rose has intense fragrance. Fragrant roses have been a seductive tradition for years. In the garden, a bed full of fragrant roses is heaven on earth. Their sweet aroma as you enter the garden gate will be so captivating. Fragrance is what we expect of the rose, whether consciously or unconsciously. It is evident when one sees a rose either in the garden, at the florist or at the rose show. The first thing a person will do is stick one’s nose to inhale the fragrance and commenting on its fragrance or lack of it. There are variations of the term fragrance like perfume, scent, incense and redolence. Fragrance suggests the odors of flowers or other growing things. Perfume suggests a stronger or heavier odor and applies especially to a prepared or synthetic liquid. Scent is very close to perfume but of wider application. Incense applies to smoke from burning spices and gums and suggests an especially pleasing odor. Redolence implies a mixture of fragrant or pungent odor. These terms are invariably used in conjunction with roses. The American Rose Society recognizes the importance of fragrance with the James Alexander Gamble Fragrance Award which is given to outstanding very fragrant roses. The ‘Wild Blue Yonder’ is the 2013 winner of the James Alexander Gamble Fragrance Award. Other roses that won the Gamble Fragrance Award are Crimson Glory (1961), Tiffany (1962), Chrysler Imperial (1965), Sutter’s Gold (1966), Granada (1968), Fragrant Cloud (1970), Papa Meilland (1974), Sunsprite (1979). Double Delight (1986), Fragrant Hour (1997), Angel Face (2001), Secret (2002), Mister Lincoln (2003), Sheila’s Perfume (2005), Fragrant Plum (2007), Sweet Chariot (2008), Louise Estes (2010), Falling in Love (2012). A rose is only half appreciated by the eye and the other half by the nose. It is the fragrance of the rose that Sappho in 650 B.C. named it the “Queen of the Flowers”. In England, they value the Old Rose fragrance in their roses that they awarded the Clay Cup for almost hundred years. Shakespeare loved the Musk Rose, the Damask, the Sweetbrier, or Eglantine, the Cabbage Rose and the Canker Bloom that he referred to them in his writings. Here in the colonies, the first sweetbriers were believed to come over in the Mayflower or soon after since it was growing in the Pilgrims’ garden before the end of the 17th century. Each year, new roses appear in catalogs. Copywriters do a fantastic job describing the roses and its attributes. I found the fragrance very subjective and if we want to grow roses for their fragrance, you have to choose your varieties very carefully. A slight fragrance in the catalog lingo is basically no fragrance at all. If you want a fragrant garden, look for roses with strong fragrance on the description. 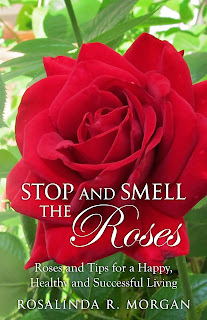 In recent years, there were many scentless roses in the market that you wonder why people are buying them. 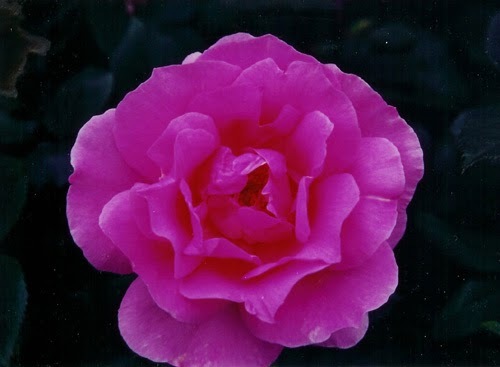 Modern hybrid teas are known to have very little fragrance. Some have none at all. The hybridizers are doing the public a disservice by hybridizing the rose too much to create a perfect formed rose that they are compromising its fragrance. Luckily, more gardeners want the fragrance back and so the trend is reversing. We should encourage the hybridizers to put more fragrance in their new creations. The “true old rose scent” is the property of the three classes of roses – Rosa centifolia, the Cabbage Rose; Rosa damascena, the Damask Rose; Rosa gallica, the French Rose. No rose can surpass Rosa centifolia for fragrance. The Hybrid Perpetual which is a cross between Rosa indica and the old Damask and French Roses produced roses with lovely old rose scent. Prominent in this group is General Jacqueminot which became the parent of a long line of fragrant roses. I saw this rose at the Heritage Garden in San Jose, CA and I was enthralled by its fragrance. The old rose scent is the most refreshing of all the flower scents. It is not bitter and will remain sweet to the end. Most of these fragrant roses are red with pink coming next in degree of fragrance. Yellow for the most part is the least scented. Single rose tend to have less fragrance than their double counterpart. Climbers for the most part are slightly fragrant. The scent of roses is affected by warmth and moisture. The scent of the roses is more pronounced on warm days than on cool days especially if the weather is dry. Roses tend to be more fragrant in autumn than in the summer. The Last Rose of Summer is said to be the sweetest of all. Roses picked up early in the morning have stronger fragrance than roses gathered later in the day. Fragrance in roses comes on various forms. One associates rose with the true old rose scent. Damask is the true rose scent and the Damask rose ‘Kazanlik’ is the most sought after rose in the manufacture of the attar of roses. Old Garden Roses – the Damasks, Centifolias, Albas, Gallicas, Mosses, Bourbons and some Rugosas have damask scent with a touch of some kinds of fruit aroma. One of the earliest Damasks is Rosa sancta found in an Egyptian tomb dated c. 170 A.D. Cleopatra carpeted the floor two feet high with damask roses to seduce Mark Anthony. Damask scented roses are associated with love and spring as evidenced in the painting La Primavera or Spring by Botticelli where he used Rosa gallica and in the Birth of Venus, he used Maiden Blush. Besides the true old rose scent, there are other types of fragrance in roses: We have the tea scent; the odors of spice – bay, clove, pepper, vanilla. During the Roman times, bay was used as crowns to protect the emperors from evil spirit and ward off harmful bacteria. In ancient Greece, the Pythian priestess ate bay before she went in to the sacred shrine at the Oracle of Dephi and started reciting verses. We also have musk, myrrh, wine, honey scent. The Tea or the Musk roses also seem to be scented of muscatel wine. Felicia, Cornelia and Buff Beauty will scent your garden with its tea and musk fragrance. Tuscany, a deep purplish red gallica has the scent of wine. Then we have a whole slew of fruity scents like apple, raspberry, lemon and oranges. The hybridization of China with Austrian Briars gave rise to roses with fruity fragrance. Mme Isaac Perriere has a raspberry fragrance. Zephirine Drouhin and Rosa Eglanteria are good examples of roses with an apple scent. Apples have been a fruit of favor since the Biblical times when Eve chose to eat it. In mythology, the golden apple was given by Paris to Aphrodite in a beauty contest which indirectly led to the Trojan War. We also have balsam, clover, violet, jasmine, and lavender scent. Most of the Old Garden Roses- Rosa gallica, Rosa damascena, Centifolias, Mosses all have the balsam scent in their leaves. Balsam was highly praised in the Bible as the Queen of Sheba took The Balm or Balsam of Gilead from Arabia to Judea and presented it to King Solomon. Many Rugosas and some Hybrid Teas like Crimson Glory and Chrysler Imperial have the scent of cloves. Some Hybrid Teas also smell of clover. In the Middle Ages, clover was a symbol of the Holy Trinity because it had three leaflets and a four-leaf clover is a good luck symbol. Jardins de Bagatelle and Jude the Obscure have scent of vanilla which I find so intoxicating. Stanwell Perpetual has the sweet scent of lavender and violet. Some David Austin’s roses are myrrh scented. One of them is Ambridge Rose. In the Bible, myrrh was given to Jesus by the Magi and again while Jesus was dying on the cross. The Egyptian also used myrrh resin in the mummification processes. Old Blush, the Green Rose and La Reine des Violettes are all scented of pepper. Gloire de Dijon and Marechal Niel have the scent of tea. It seems that there is a correlation between yellow or ivory colored roses and tea scent. A form of Rosa indica odorata, the Tea-scented Rose from China smell like fine China Tea as distinguished from Rosa indica, the China Rose which is not always fragrant. This rose found its way to France and later crossed with the old Musk Rose which gave rise to a new class called Noisettes. The old Musk Rose scent is not exactly as you would expect a rose to smell. A fine example of Noisettes is Marechal Niel, a fragrant but tender rose that can only be grown outdoors in mild climates. Late in the nineteenth century, Hybrid Perpetual was crossed with the Tea-scented rose which resulted in the Hybrid Tea of the modern days. The perfume of the rose is believed to have curative powers. In the olden days, roses are used to make all sorts of medicinal potions to cure maladies and drive away bad spirit. A bouquet of roses uplifts the spirit any day of the year. Even a single rose in a room will liven it up on dreary days. We are very lucky to be growing the rose. Take a break and smell your roses! Copyright © 2013. By Rosalinda R Morgan, author of “BAHALA NA (Come What May”. As I talk to more people about growing roses, I was amazed at most of the answers I got, “Roses are hard to grow. You have to spray constantly.” Spraying scares some people. With all the talk on sustainability, this is one thing that we as members of a rose society should pay attention to. Most people just want to grow roses without spraying those chemicals and that is the main reason “Knock Out” roses are so popular. We have to educate them that there are alternative to spraying and there are other easy roses besides Knock Out roses. Feeling stressed out lately? You’re not alone. In a world buzzing with frenetic activities, we find ourselves as busy as ever. No wonder we are all stressed out. It is time to change our bad habits. Most of our health problems are due to our unhealthy lifestyle. Studies show that stressful living causes health problems. Find out how we can improve our well-being by following simple tips for stress-free living. Inspire yourself into a healthy lifestyle! Do you know that roses have curative powers? In the olden days, roses were used to make all sorts of medicinal potions to cure maladies and drive away bad spirits. A bouquet of roses uplifts the spirits any day of the year. Even a single rose in a room will liven it up on dreary days. When we are in distress, a rose will cheer us up.